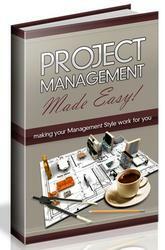 You can use the Microsoft Project Gantt Chart to set up and rearrange your tasks according to your custom WBS. 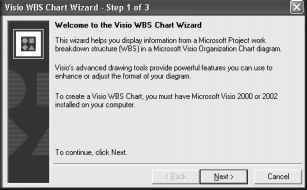 If you use Microsoft Visio 2000 or later, you can take this a step further and use Visio's charting features for your WBS structure. You can then display project information in a Visio WBS chart by using the Visio WBS Chart Wizard, which is installed with Microsoft Project. 1 Open the project that contains the WBS codes. The WBS codes must be identified and applied to the tasks before running the Visio WBS Chart Wizard. 2 If necessary, show the Visio WBS Chart toolbar. 3 On the View menu, point to Toolbars and then click Visio WBS Chart. 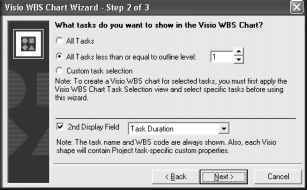 4 On the Visio WBS Chart toolbar, click Visio WBS Chart Wizard. The Visio WBS Chart Wizard appears (see Figure 3-22). Figure 3-22. 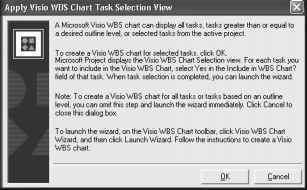 The Visio WBS Chart Wizard consists of three steps. 6 Follow the instructions to create the Visio WBS Chart. This procedure creates a chart for all tasks or for all tasks based on a selected outline level (see Figure 3-23). Figure 3-23. Specify which tasks and information you want the Visio WBS chart to include. 1 On the toolbar, click Visio WBS Chart Wizard and then click Apply Task Selection View (see Figure 3-24). Figure 3-24. Click OK to add the Include In WBS Chart field to the current task sheet. 2 Click OK. The Include In WBS Chart column appears in the current task sheet. 3 For each task you want to include in your Visio WBS chart, click Yes in the Include In WBS Chart field. 4 On the Visio WBS Chart toolbar, click Visio WBS Chart Wizard and then click Launch Wizard. 5 Click Next. The Custom Task Selection option is selected in the wizard page. 6 Click Next. The WBS Chart of your selected tasks is created in Visio. 8 To remove the Include In WBS Chart field from the task sheet, click the column heading and then press Delete.